February 2016, Volume 27, Issue I, pp 19-36. When we speak today of insurgent practices, the differences between north and south seem to dissolve. On both sides problems stemming from inequalities, struggle to access and secure basic social services, as well as increasing intolerance and political polarization, show that dialogues that exchanges can fertilize important dialogues. This paper helps us build some of these theoretical and empirical bridges. Its empirical focus on Brazil, do not prevent this research to produce insights applicable to the third sector in many (perhaps most) countries. Primary data is presented from an extensive fieldwork, encompassing a range of methods over a period of time. In terms of theory, the paper draws on the literature of social movements literature, citizenship, and organisational practices of CSOs. The concept of insurgent citizenship is used to bring these three strands of literature together. The main original contribution of the paper is demonstrating similarities where one expects differences. Analysing organisational strategies, employed by the Brazilian Landless Movement to empower the poor, the authors draw convincing parallels with service-providing CSOs. Most scholars and practitioners in the field tend to think of social movements and social service CSOs as very different in their daily functioning. This article proves otherwise. Another original contribution of the work is a systematic study of an internal dynamics of the Brazilian Landless Movement. While there are many studies of social movements, few scholars are able to see and describe a movement "from the inside," through the eyes of its participants, to the extent this article does. As policy implication, the article provides insights on how to promote participation, build solidarity and encourage participants in defining and re-defining the problems and courses of action. It describes practices, strategies and tactics of a successful long-lasting social movement. Those working on empowering poor and marginalized communities can learn from this article how to organise and sustain a movement, an organisation, or a self-help group. This paper is an original contribution in that it focuses not only on the rights based issues of migration, but critically examines volunteering within the context of migration. The authors engage with the literature and theories of volunteering, citizenship, and welfare, drawing on original research with Turkish, Moroccan and Surinamese women in the Netherlands. This work innovates on several fronts, it links the discussion of volunteering to the very current and relevant issue of migration, focusing on women. Research results reflect an extensive qualitative work based on life stories. They develop a theoretical framework by identifying the existing policy goals and rationales behind workfare volunteering as a tool to promote integration and to relate these policy rationales to the models of citizenship from which they originate. It brings a critical approach to examine the gaps between policy aims and outcomes. It draws on the findings from the Netherlands, but the issues it addresses are relevant to many other countries across the globe given the global nature of migration. The paper has very clear policy implications around workfare and volunteering policies. It shows the outcomes (intended and unintended) of such policies. It particularly offers a critique of workfare volunteering as a set of policies which are becoming more widespread in many countries in Europe and North America. The conclusion ends with policy suggestions for 3rd sector organisations as well as policy makers about the limits of volunteering in the context of migrant integration into the labour markets of recipient states. "Surreptitious Sybiosis: Engagement Between Activists and NGOs"
As chair I want to again thank the members of my committee who read and and re-read and assessed the many fine papers published by Voluntas in 2015. As in 2014, we focused on empirical and analytical rigor, originality, wide applicability and important policy implications. What "Surreptitious Symbiosis: Engagement Between Activists and NGOs," does is to brilliantly address a missing link- between civil society organizations and street protests. Through interviews in Athens, Cairo, London and Yerevan, Marlies Glasius and Armine Ishkanian have illuminated the complex, varied, and often nuanced connections and collaborations between individual street activists and NGO staff in four very different cities. The authors' most original contribution is to put aside assumptions of what formal cooperation between civil society and activists should look like. Instead, they looked at reality and found that in all four cities there were activists who both criticized the formality and financial ties of NGOs but also made use of NGO offices for meeting space, and/or relied on NGO research. In other cases, paid NGO employees participated in street protests as individuals. These common patterns generally prevailed, despite differences between, for example, London, where civil society organizations are well established, and Yerevan, where civil society organizations were often created by foreign donors. A related contribution is that the article illuminates the connections within civil society. Many definitions of civil society, such as "more than a collection of NGOs" list other players such as a "sphere of public debate"  Glasius and Ishkanian manage to connect the players, and they also widen the sphere of public debate beyond journalism and even public talk to include street protests. London, Athens, Cairo and Yervan all experienced " extensive and sustained mobilization, including street demonstrations," a condition widely applicable to many other cities. The article, and particularly its research methods— based on semi-structured interviews in 2013 with 12-20 respondents— could be duplicated elsewhere. Since the tension between activism and organizational/financial imperatives is highlighted throughout the article, it would be interesting to test the methodology in more cities, perhaps in Latin America or Asia, where civil society organizations were created locally before foreign donors were fully organized and where NGOs tend to have longer histories and be more autonomous. A major conclusion of the article is that social and political change can occur without being coopted by a civil society industry. The policy paths forward include 1) new forms of grant making and 2) rejuvenation of NGOs by activist staff members. Although the authors are realistic enough to observe that neither of these positive scenarios is assured, a third possible scenario might arise from the value that the activists in this study placed on NGO research. In assessing the many valuable articles published in 2014 by Voluntas, we, as a committee, based our assessment on theoretical and empirical quality, wide conceptual applicability (to many countries), originality, and policy implications. This article met all of these criteria. Although extremely complex, this article was theoretically sophisticated, and based on a wide range of studies by other scholars. Conceptually, it is applicable to civil society anywhere. The article is highly original, since the authors were able, for the first time, to bring together a diverse and very extensive literature. Finally, the article has strong policy implications, provided that “policy” is not confined to the governmental sector. For example, the authors recommend that “functional solidarity,” which is the defining overall identity of hybrid organizations, should be reflected in mission statements integrating market and civil society values, or impact assessments, or board members representing different sectors. 4)Hybrid Organizations as Constitutive of the Nonprofit Sector. Finally, they focus on individual, structural and practice-based approaches to organizational identity as a way of conceptualizing hybridity. All of this is complex, but clarified by a table that places these approaches on one axis and market, hybrid or civil society identity on the other. Shining Light on Charities or Looking in the Wrong Place? The committee has made their selection for 2014 and will select the best 2015 paper next year. 4) Hybrid Organizations as Constitutive of the Nonprofit Sector. Second, they focus on individual, structural and practice-based approaches to organizational identity as a way of conceptualizing hybridity. All of this is complex, but clarified by a table that places these approaches on one axis and market, hybrid or civil society identity on the other. The committee looks forwarding to reading all of the articles published in 2015, and to selecting the best paper in time for the Stockholm Conference. ISTR’s journal Voluntas is a highly productive journal, which has published an increasing number of articles in recent years, and which has also become indexed in the ISI Social Citation Index. Voluntas published 49 papers in 2012 and 53 in 2013. This included one special issue on civil society in Africa, and several thematic sections; on non profits and the provision of social services, on fundraising and on charity accounting, reporting and regulation. Reflecting the character of this academic society, the articles published spanned a wide range of thematics, and a varied set of theoretical and methodological approaches. The Best Article in Voluntas Award is a newly created award generously funded by our publisher, Springer. 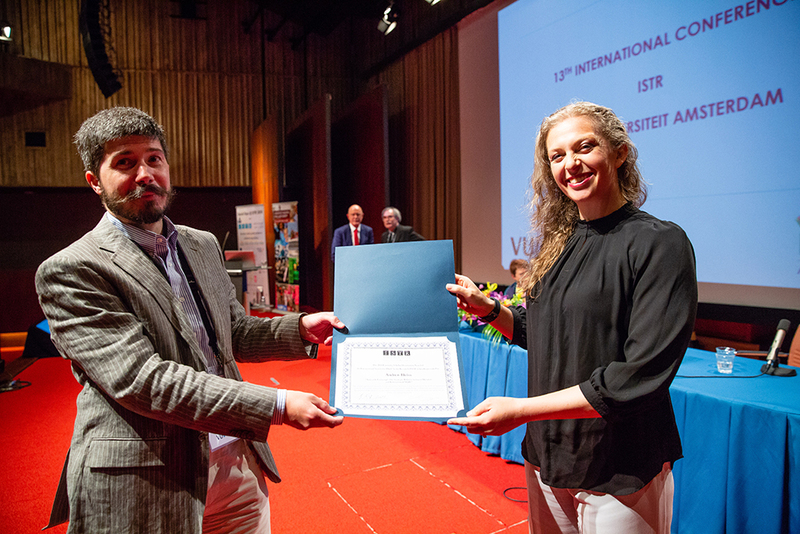 The award is to be given biennially at the ISTR International Conference for the Best Article in Voluntas during the previous two year period. A committee was established to read the journal articles for 2010 and 2011 and select the best article. The committee included Adalbert Evers, Germany (chair); Eliza Lee, Hong Kong; Kari Steen-Johnsen, Norway; and Ebenezer Obadare, USA. This award, established in 2006 by an anonymous donor, is given once every two years at the biennial ISTR conference to the author of the best dissertation in the field of comparative study of civil society organizations, nonprofit organizations, philanthropy, and voluntarism and related issues. This award is presented biennially for an outstanding poster that contributes to the field of civil society, third sector, nonprofit organizations, philanthropy, voluntarism and related issues. In presenting the award, Stefan Toepler, chair of the publications committee, which is responsible for selecting the winner for best poster, said "in selecting our awardee, we look for both intellectual and visual appeal of the poster. Intellectually, we look for clearly presented statements of the research question and approach that also convince through concision. Visually, we like posters that utilize different design elements without being distracting and that easily guide the eye along … bonus points go to posters that manage to do so without overtaxing the eyes of the grey-haired crowd and do not force us to open the magnification app on our iphones." Click here to see the award winning poster! On behalf of the publications committee, I am delighted to present the best poster award tonight. 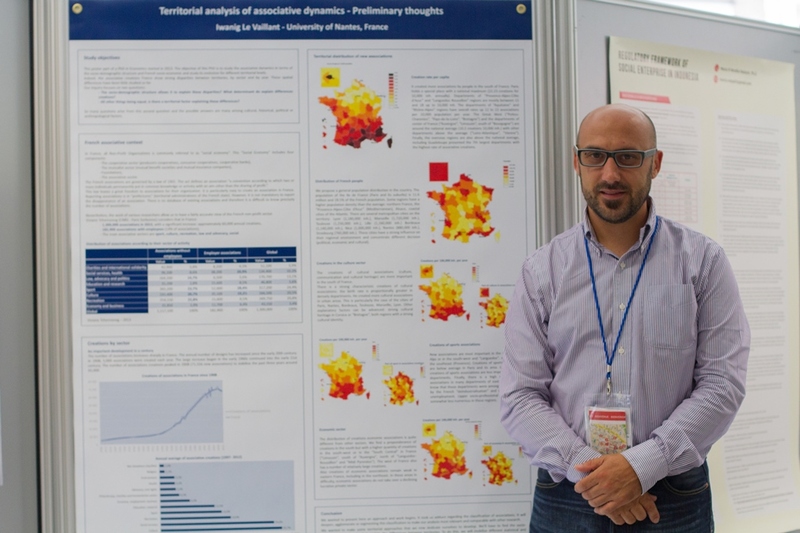 The work on this award committee is particularly rewarding in many ways, reviewing the posters allows us to gain an excellent overview of a range of very exciting research projects, without – frankly - having to spend weekend after weekend reading the dissertations or Voluntas articles, like the colleagues from the other two award committees have to do. More, as Paul Dekker rightly noted last year, in this age of the Internet, posters with short texts, infographics and other visualization tools are really where all our futures will likely lie. Perhaps as a reflection of this, a slight increase in the number of posters this year compared to Muenster, without any noticeable decline in quality of them. The committee – Paul Dekker, Stefan Toepler and myself – was very impressed by their high quality. We particularly liked that it was not just students, but also senior and experienced scholars in our field that decided to make use of the poster forward – – two very good effect. A trend that the committee hopes will continue in future conference. Cath Anne Hill of Lancaster University drew us in with a visual representation of a fairytale book. In it, she told the tale of her narrative research approach to developing a values-based social impact concept that draws on the voices of clients and employees. In our modern world, where everything is about markets and measures rather than values and what is important about being nonprofit, this almost sounds like a fairytale; the committee very much hopes it will come true, and we will be looking forward to reading the conclusions of Cath Anne’s research in due course in Voluntas. Congratulations on a very well done poster and a very interesting and promising research project! The best poster award is smaller than the best dissertation and the best Voluntas paper award, and the poster jury needed to reach a decision in only a fraction of the time needed by the colleagues of the other two awards, but the poster award is actually the most important one. For let us be realistic: many people do not read dissertations, they hardly read articles. They might quote them if they are available on the internet, but that is it. We are going to shorter and shorter texts and infographics and other visualization tools are becoming more important to get attention. So posters are by far the best way to communicate research and research findings: you have to present everything in an attractive way on less than a square meter for consumption and consideration in less time than a TED talk. "Grassroots Initiatives: Women Social Entrepreneurs for Poverty Alleviation"
A new innovation for ISTR, this experimental competition offered a light-hearted way for students in the ISTR PhD Seminar to practice the art of distilling their ideas down to the core questions and concerns in 3 minutes and 1 PowerPoint slide. Ten students all gave very good presentations and the experience was fun for the audience. A prize was awarded to the person who made the case for their research in the most clear and compelling manner, and the winner made her presentation to the entire plenary. But besides the fun, the 3-minute thesis teaches important lessons – research should be designed to be useful, and in order to be useful (and in order to funded!) the users need to understand it and believe in it. Sometimes 3-minutes are all we have to get the attention of our audience. It is ISTR’s hope that this competition provided an opportunity to make the wider conference attendees more aware of the PhD seminar and hopefully inspired the students to feel more connected to the wider group of scholars and begin to see it as their research home into the future. This lecture has been established by the Society to honor a member who has made a significant contribution to the field of Third Sector Research. The lecturer is asked to reflect on their work in the field of Third Sector Studies as well as the development of the field during their scholarship. Stanley Katz (Professor in Public and International Affairs at the Woodrow Wilson School of Public & International Affairs at Princeton University, and Director of the Princeton University Center for Arts and Cultural Policy Studies). Click here to read more.